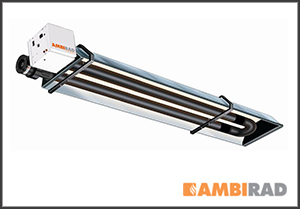 Ambirad is Europe’s leading developer and manufacturer of energy efficient radiant and warm air heating systems for industrial and commercial environments. Their Ambirad brand is renowned worldwide and can be easily seen in familiar places, such as DIY stores, warehouses, retail outlets, and throughout industry. NORDAIR, as part of the Ambirad group, produce energy saving overdoor air curtains. Another group company, BENSON, design and manufacture a complete range of Warm Air Heaters. Please provide us with your requirements and a drawing/sketch, where we would be pleased to design the best system for your needs. Installation can be arranged also. 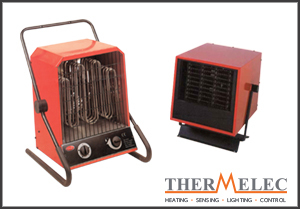 efficient and powerful heaters on the market. A diverse product range, providing over 30 models, has been designed and presented for use in many application areas, including; ZONAL HEATING for hospitality, public and industrial ambient heating, indoor or outdoor. INDUSTRIAL PROCESSING, solving many production problems in industry and handicraft. AGRICULTURE in various area heating applications, and animal welfare. VARMATEC® heaters offer the user the best results in performance, operational cost saving, safe utilisation, and comfort. Portable (ANB) and fixed (RMO) electric air heaters, are suitable for convenient heating of problem areas within workshop, factory, or warehouse areas. Available from 3.6kW to 18kW, with adjustable thermostat, and multiple heat settings. Flexible mountings are available allowing easy position adjustment, as required. Can also be used to distribute cool air (no heat function). Can be used with a timer. providing over 30 models, has been designed and presented for use in many application areas, including; ZONAL HEATING for hospitality, public and industrial ambient heating, indoor or outdoor. INDUSTRIAL PROCESSING, solving many production problems in industry and handicraft. AGRICULTURE in various area heating applications, and animal welfare. 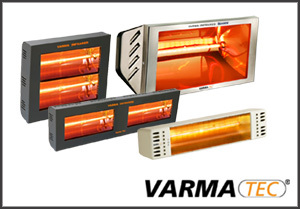 VARMATEC® heaters offer the user the best results in performance, operational cost saving, safe utilisation, and comfort.